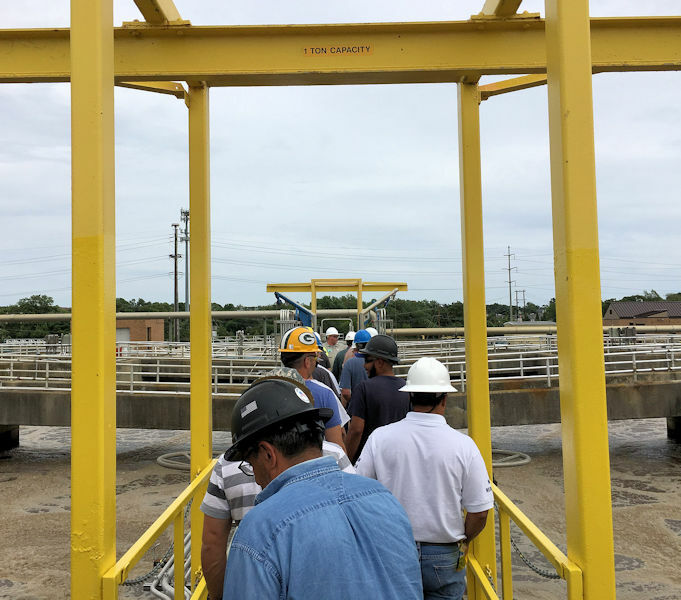 Wastewater professionals tour the Narragansett Bay Commission (Providence, R.I.) Fields Point wastewater treatment facility as part of the Wastewater Operator Leadership Boot Camp. Photo courtesy of Rhode Island Department of Environmental Management (RIDEM). When you hear the term boot camp, visions of crawling through mud under barbed wire or climbing up a 6-m (20-ft) wall may come to mind. 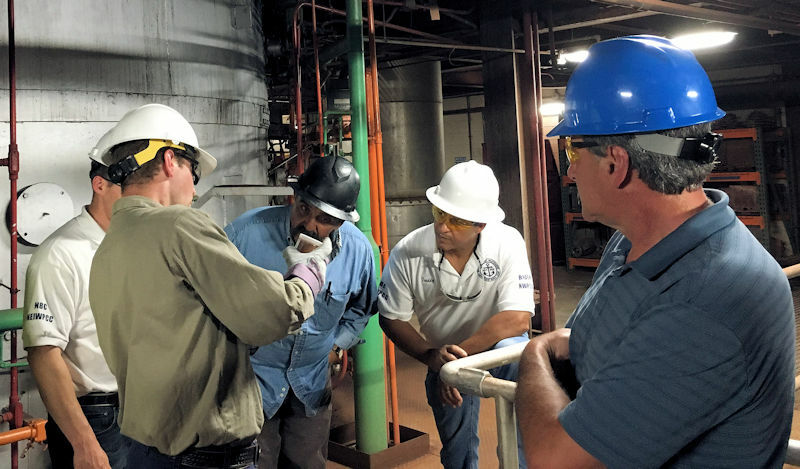 But wastewater operators in Rhode Island who have been through their version of boot camp, faced very different challenges. 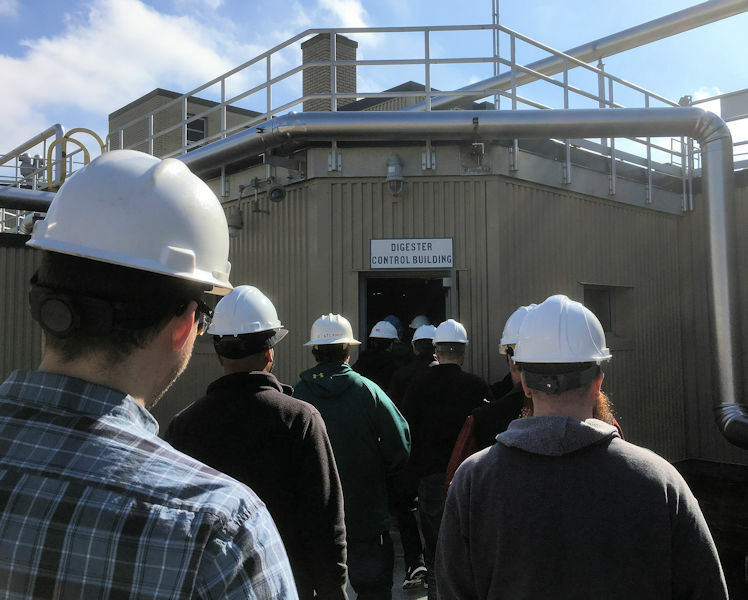 Program participants enter a digester control building at the Narragansett Bay Commission Bucklin Point wastewater treatment facility to get hands-on education and ideas for how to improve processes at their own facilities. Photo courtesy of RIDEM. 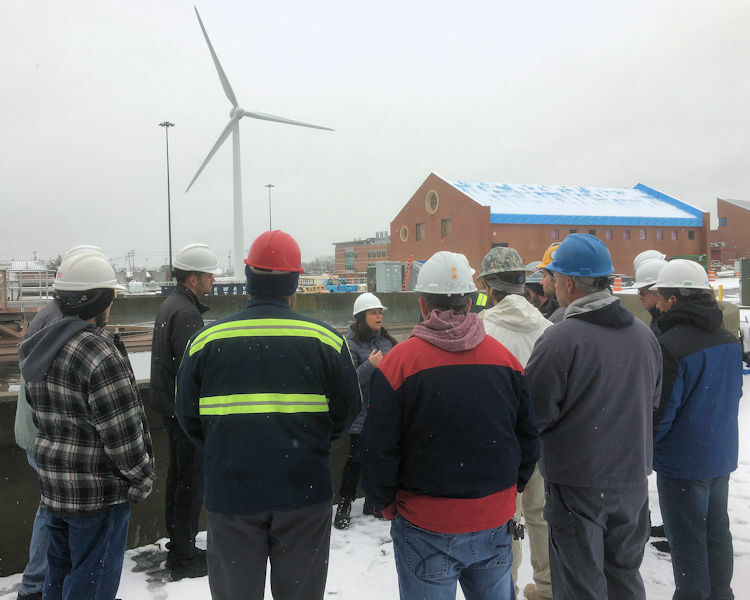 “As an engineer, we focus on technical content, but the real goal [of the program] is to get them to think outside of the box,” said Bill Patenaude, a principal engineer in Rhode Island’s Department of Environmental Management Office of Water Resources, who created and has managed the program since its inception in 2007. Boot Camp participants gather for facilitated professional and personal development aimed at making them better managers and leaders. Program creator Bill Patenaude, a principal engineer in the RIDEM Office of Water Resources, shares his insights as facilitator Rebecca Twitchell listens. Photo courtesy of RIDEM. Operators enrolled in the boot camp must attend one class each month. The coursework covers the topics of technical, professional, and personal development, which can range from laboratory work to discussing how to talk to the media, Patenaude said. Classes are taught by volunteers and one instructor who receives a small stipend, Patenaude said. They take place all over the state of Rhode Island. Boot camp participants get a tour of the secondary treatment processes at the Cranston Water Pollution Control Facility. Photo courtesy of RIDEM. Now the organizers try to get the attendees to go to as many water resource recovery facilities (WRRFs) around the state as possible, particularly the WRRFs run by the Narragansett Bay Commission (Providence), which happen to be two of the largest facilities in Rhode Island, Patenaude said. Classes also are offered at the R.I. Emergency Management Agency to discuss topics related to emergency management. They’ve even gone to the pavilion on the beach and had sessions in hunting/fishing lodge to show how wastewater treatment affects the environment and all industries, Patenaude said. “We try to give them a wide view of what’s going on around the state rather than having them in one training room for all 12 sessions. We want them to see how all the decisions they make affect all these different things,” Patenaude said. The attendees aren’t allowed to skip any classes; they must be made up later to complete the program. And at the end, participants graduate at the Narragansett Water Pollution Control Association’s annual tradeshow and clambake. 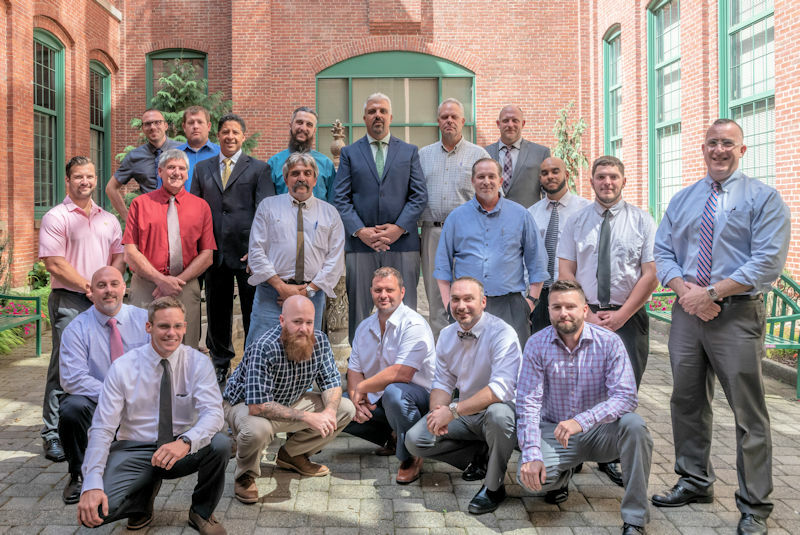 Graduates of the 2017 Wastewater Operator Leadership Boot Camp pose for a picture with program creator Bill Patenaude (right). Photo courtesy of RIDEM. So far, 80 people have graduated from the program, many of whom are in management positions, according to a fact sheet. Some graduates even come back to speak to new attendees. Since starting the program, organizers have made some changes. In addition to breaking out of the traditional classroom setting, Patenaude said the program now incorporates more interaction with environmental advocates since the work that they do correlates to the work done by wastewater operators. Both are trying to keep the environment safe and water clean. Boot camp participants get hands-on education from other wastewater professionals as motivation to think outside the box. Photo courtesy of RIDEM. The boot camp also has expanded outside of Rhode Island to all the other states in the Northeast. Those states have made their own spins on the program. Those versions, in turn, influence Rhode Island’s program. Patenaude said it’s feasible for other states outside of the Northeast to start their own boot camps. But he reminds others interested in emulating the program in their home state that traveling across Rhode Island is “fairly easy”. Other states can conduct boot camps regionally or in their counties to make travel easier for participants, he said.